Welcome To The Deerfield Golf Academy! The Deerfield Golf Academy is your source for the area’s most innovative, professional and experienced golf instruction. Whether it’s private lessons, group lessons, camps, clinics, or a program that focuses on a particular aspect of golf in which you would like to improve, the Deerfield Golf Academy has – or will design – the perfect game plan for your success. Just because the Deerfield Golf Academy features one of the area’s most well known names in golf doesn’t mean it’s for only the best players that are looking to take their game to the next level. Golfers of all ages and ability levels will find a comfortable fit in this approach that focuses on an individualized program of instruction with an emphasis on “fun” and enjoying this game more. “Bring Your Own Group” – Bring Your Friends For More Fun! I hope you will take the time to visit Deerfield and introduce yourself. As someone who grew up in Delaware, I not only have a passion for this great game, but I have a passion for Delaware golf. Deerfield is one of the region’s most well respected, well maintained layouts. I am thrilled to call it my new home. I enjoy breaking down the game for my students in a way that makes learning simple and fun. There are many strategies that we can implement together that will lower your scores, and make the game much more enjoyable. My experiences playing the US Open, on national television on Big Break, and in any number of collegiate and professional tournaments have helped me develop an approach to both the mental and physical aspects of the game that I look forward to sharing with my students. Find me in the Pro Shop or out on the practice tee on your next visit to Deerfield. I will do whatever I can to help you shoot lower scores and become a better golfer this season. Deerfield is very pleased to announce that Michael Tobiason, Jr. has joined the Deerfield team as Head Golf Professional. While you probably know Michael from his participation in the US Open in 2011 at Congressional Country Club near Washington DC, or his time as a contestant on the Golf Channel’s Big Break (watch him here), Michael has quickly built a reputation for one of the area’s most well known and well respected golf professionals. He will be a fantastic addition to the Deerfield team, designing and leading all instructional programs and supporting the overall golf operation. 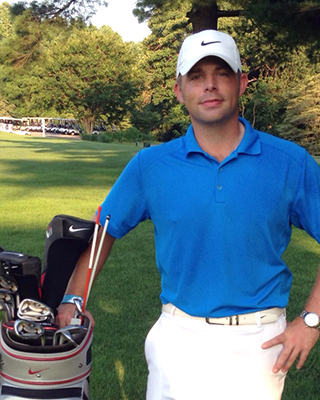 Michael was born in Wilmington, Delaware and began to develop a love for the game of golf at an early age. By the time he was seven years old, he earned a presence in the junior golf community, playing in local and regional tournaments. While majoring in Human Resource Management at Goldey Beacom College, Michael was selected as a PING All American two years in a row. He continued to fine tune his game, and turned professional in 2006. Since then, he has served as an assistant professional at area country clubs while pursuing a professional playing career. As a professional, he has played in 200 events, earning 75 top-ten finishes, 51 top-five finishes, and 13 wins. Certainly, his 2011 participation in the US Open at Congressional Country Club and the spotlight earned from participating in the Golf Channel’s series Big Break (watch him here) at the Greenbrier in 2013 are among his proudest moments to date as a player. Looking ahead, he hopes to share his passion and knowledge of the game he loves with his students and the golfers at Deerfield. His philosophy of making the game as simple as possible to lower scores – and make the game of golf more enjoyable – is one that will be popular with golfers of all ages and ability levels. Originally from Coudersport, PA, Ben is a graduate of the Golf Academy of America where he earned certificates in Teaching, Club Repair, and Tournament Operations before the start of his official career at the Reynolds Golf Academy at Reynolds Lake Oconee. Ben then continued his golf career by teaching at GolfTEC in King of Prussia, PA, where he was able to learn how the body bends, turns and tilts through Motion Capture Technology, teaching students of all levels at Deerfield in Newark, DE as the Lead Staff Instructor, and working as a Teaching Professional at the Dana Rader Golf School in Charlotte, NC, a Top 25 Golf School in America, where he earned multiple certificates of training. Most notably was when Ben achieved becoming a Class “A” PGA Professional in 2013. He has also been a 2-time nominee for Golf Digest’s Best in State Teacher and has been mentored under two of Golf Magazine’s Top 100 Instructors, Dana Rader and Charlie King. Ben returned to Deerfield at the beginning of the 2018 as the Director of Instruction.